Christmas cacti, known as Schlumbergera or Zygocactus, blooms at Christmas and also sometimes around Easter if cared for properly. A month prior to Christmas you will be able to watch the tips of the leaves begin to grow and form buds. At Christmas, as if by magic, the buds open to a beautiful flower that will add color and warmth to any holiday season. 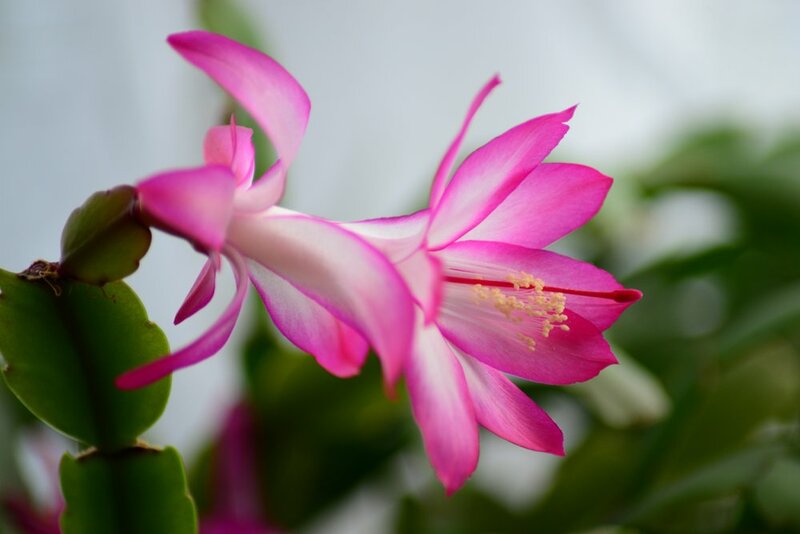 A Christmas cactus will enjoy bright but indirect sunlight. Keep the plant in a well lit area, like near a window, but keep it out of direct sunlight. Direct sunlight can stunt its growth and burn the leaves. Usually when we think of cacti, we think of desert locations, but the Christmas cactus is a tropical plant. They prefer temperatures ranging from 65 to 80F. Also, they like humid environments. Place them on a tray filled with gravel and halfway filled with water. The water will evaporate and raise the humidity of the air around the plant. Unlike most desert cacti, this variety cannot tolerate completely dry soil. If the soil gets too dry, the flower buds will drop, and the plant will wilt. Feel the soil with your fingers; if it feels dry, it is time to water. However, don’t overwater. Too much water can lead to spots from white rot to form and the leaves will likely fall off. It is also a good idea to mist the cactus regularly when in dry conditions. Plants that are actively growing should be given a blooming houseplant fertilizer according to the label directions. Fertilizing is important to keep the plant in good condition; the joints between segments are fragile and can easily break if the plant is in poor health. You should also feed it 2-4 times per year with a 20-20-20 feed, but stop all feeding about a month before buds appear (usually the end of October). Christmas cacti are thermo-photoperiodic, meaning it grows according to specific light and temperature conditions. It will set buds when the day and night length are close to equal and the temperature drops to 50-60F for several weeks. Keep it in a dark room at night during the fall months. During daytime hours keep it in a spot where it will get light, but indirect sunlight. At night during this time it is important to keep it in complete darkness. Exposure to any artificial light is enough to interfere with bloom growth. Begin dark treatments by mid-October to have plants in full bloom by the holidays. It usually takes 6-8 weeks for buds to form. About one month after blooming, prune your Christmas cactus. This will encourage the plant to branch out. Prune your cactus by removing 1-2 sections behind the bloom. When grown year-round Christmas Cacti can live for quite some time. They can even be passed down through generations! Be sure to turn them at regular intervals. Otherwise, you may end up with lush bloom on one side and very few on the other. When repotting your cactus be sure to use fresh, new potting mix. The cactus will only grow as big as the pot. If you want it to grow bigger, transplant to a larger diameter pot. These instructions are based on having a cold Christmas. If you live in the Southern Hemisphere, you may have a harder time forcing it to bloom for the holidays. The best time for repotting is from February to April, about once every three years.